Day 1 - Delhi, a Rich Melting Pot of Old and New. Day 3 - Agra and the views of the Taj Mahal. Accommodation: Jaypee Palace Hotel Agra. Day 4 - Sunrise at the Taj and Jaipur, the Pink City. Day 5 - Jaipur Sightseeing. Day 6 - Bikaner, Camel Country with a Royal Aura. Accommodation: The Laxmi Niwas Palace, Bikaner. Day 7 - The Sun City, Jaisalmer. Day 8 - Jaisalmer Sightseeing. Day 9 - The Blue City of Jodhpur. Day 10 - Explore Mehrangarh Fort. Day 11 - Udaipur, Venice of the East. Accommodation: The Leela Palace Udaipur. Day 12 - Udaipur Sightseeing. 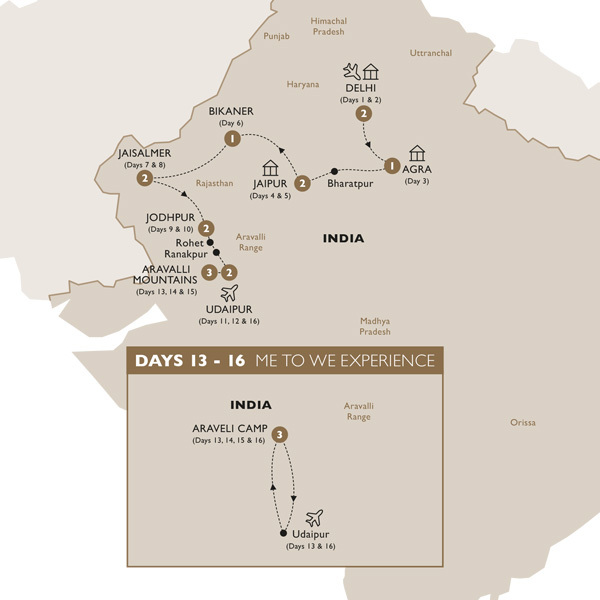 Day 13 - From Udaipur to your lodge. Accommodation: Araveli Cottages and Tented Camp. Day 14 - The Locals of Araveli. Day 15 - Depart Udaipur, fly to Delhi. Day 16 - Depart Udaipur, fly to Delhi. Dining Summary: 15 Breakfasts (B), 6 Lunches (L), 1 Afternoon Tea (AT), 7 Dinners (D) and 3 Dinners with Wine (DW). Festive Highlight Dinner: 16 Dec departure includes a Christmas Eve Highlight Dinner in Jodhpur. Aravalli Mountains: Participate in a sustainable international development project. Aravalli Mountains: Explore nature as you walk through the hills of the Aravalli Mountain Range.